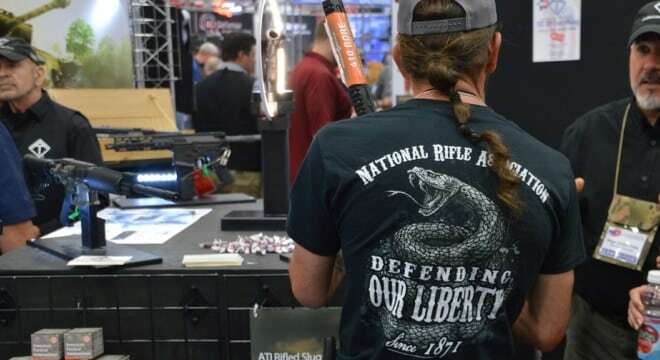 The 147th National Rifle Association’s Annual Meeting and Exhibits held last week in Dallas broke the organization’s record. In an announcement on social media on Monday, the group noted that attendance at the three-day event hit 87,154, a figure that beat their longstanding record from 2013 and was about six percent higher than the figures seen in Atlanta last year. “Together, we set a new record! We can’t wait to do it again next year!” said the group, whose leadership said last week is now approaching 6 million dues-paying members. A big draw for attendees at this year’s event, besides the over 800 vendors at “Freedom’s Safest Place” was a promised speech by President Donald Trump, his fourth to the organization. In addition to Trump, the event saw other such influential speakers as Vice President Mike Pence, Texas Gov. Greg Abbott and both of the Lone Star State’s U.S. Senators — John Cornyn and Ted Cruz — address the crowd. While legal firearm carry was encouraged in areas not under Secret Service protection, according to the Dallas Police Department’s crime reports database, there was only one reported incident during the three-day meeting within a half-mile of the Kay Bailey Hutchison Convention Center where the NRA event was held — a motor vehicle theft that occurred at around 1 a.m. Sunday morning. Fueled by widespread calls for gun restrictions in the aftermath of the mass shooting at Marjory Stoneman Douglas High School in Parkland, Florida, the Second Amendment group has seen a surge in both membership and donations in recent months. A protest by gun control advocates on May 5 at Dallas City Hall saw about 150 gather.